After living in Brighton for nearly 4 and a half years, you would be surprised that I had never visited Bills. I had heard mixed reviews from lots of different people, so I had always been apprehensive about going, as there were always other places that I knew were going to be good for brunch or tasty homemade food. Bills started off as a small, independent green grocery store located in central Lewes. After some terrible flooding in 2000, the shop was ruined and the owners had to start from scratch. They decided to reopen with a cafe on site as well, serving fresh, homemade food, which proved popular with the locals. As word spread, the business grew, and they opened a cafe in Brighton in a former bus depot on North Road in 2005. 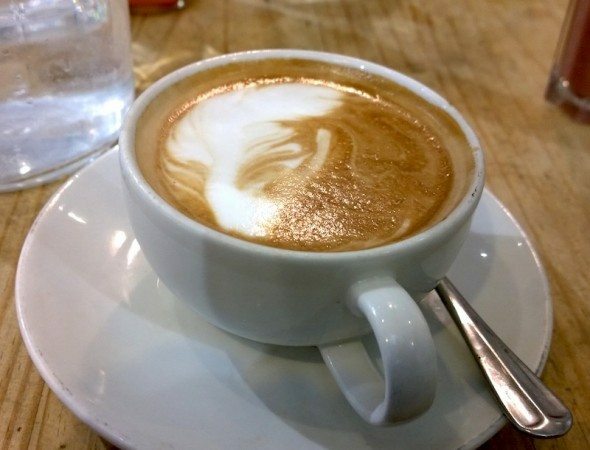 To this date they now own nearly 60 cafes across the UK with many more opening up soon. On a cold, but sunny Saturday, my partner and I decided to head to the Brighton shop for brunch to try it out. I had booked in advance, (you can book online on their website, and if you do go, it is best to do this as early as possible as the places seem to get booked up quickly), which was a good idea as there was a slow moving queue at the door when we arrived. We joined the queue, not knowing who had booked and who hadn’t, and then one of the ladies at the front said she had booked so we waited patiently behind her. After 10 minutes and no staff coming to acknowledge anyone at the door, I decided to walk further in and got the attention of a waiter who apologised, found our booking and led us to our seat. Turns out the lady at the front hadn’t booked, so I think she was a bit confused too! It would have been good if the wait staff had come to the door to greet people though as no one really knew what was going on! The cafe itself is large, with high ceilings and a an industrial feel. 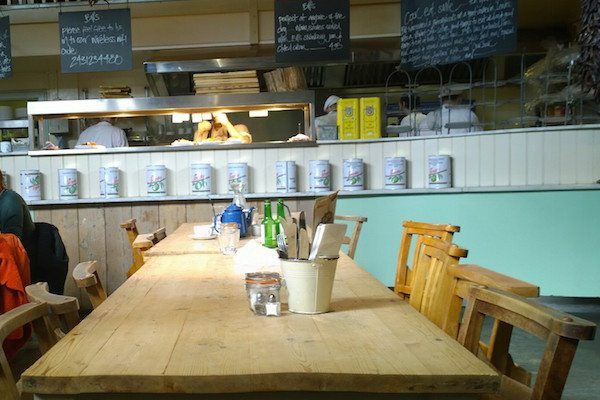 There are rustic, wooden tables each with vintage tins filled with cutlery and napkins, and there are dried chillis hanging from the ceiling, giving you the feeling of a farm house style place and somewhere that is offering fresh, homemade produce and food. They have a retail area to the right of the front door packed with Bills brand produce such as chutneys, teas, coffee and relishes; toward the back of the cafe there is an open kitchen; and there is an upstairs mezzanine with seating for diners which I would imagine would be a good place for people watching. Once seats we were given menus and bought water straight away. Our waiter was really friendly which was nice, and the atmosphere was buzzing. Even though it was busy, it didn’t feel stressful and the staff seemed cheerful. We were there just before lunch time, around 11:30, so we were given a brunch menu to look at. As 12:00 hits they start serving lunch food, but in the weekends brunch is served all day. 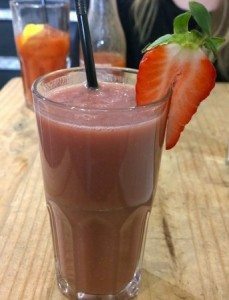 They have a selection of smoothies, milkshakes and juices, as well as teas and coffee to quench your thirst, and the brunch menu includes your standard brunch classics, including benedicts, pancakes, and full English breakfasts with gluten free options too. The waiter was quick to come and order so we decided to get the ordering done and out the way. 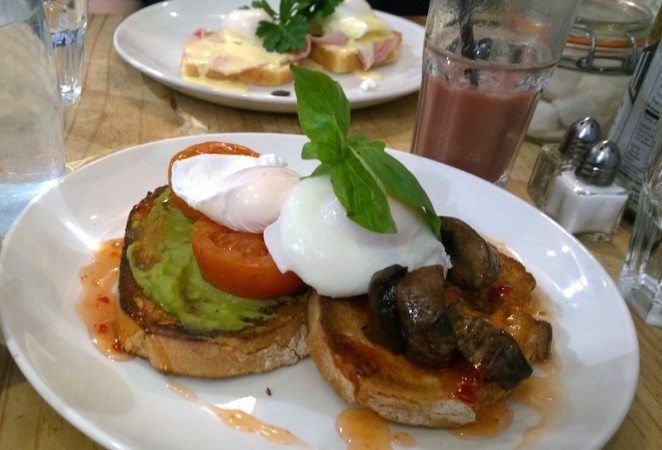 I decided to go for the Eggs Benedict with gluten free bread instead of the offered English muffin, and my partner chose the veggie breakfast with additional beans, which included 2 poached eggs, toast with guacamole and hummus, mushrooms, grilled tomatoes, sweet chilli sauce and fresh basil. 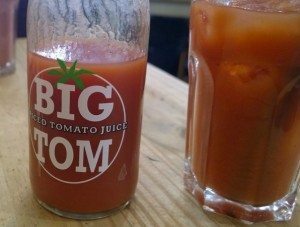 The drinks came quickly, I ordered a Big Tom spiced tomato juice as I am generally not a fan of fruit smoothies as I find them too sweet and I am also quite selective about where I drink my coffee! My partner however wanted a coffee, he ordered a flat white and also a strawberry and banana smoothie. The smoothie tasted and looked pre-bottled, and when looking on the way out there was not a smoothie maker in sight. I am not entirely sure they are made off premises, but it seemed a bit strange as it seemed like the type of place that everything would be freshly made. The coffee was the right temperature for drinking but taste slightly watery and bitter which was a shame. Our food took a while to arrive, I think we waited around 30 – 40 minutes altogether, however the place was rammed and they were super busy. My benedict was topped with flat leaf parsley and toasted pumpkin seeds, and the eggs were softly poached and runny. The hollandaise was light and creamy, but my gluten free bread was cold and untoasted, which wasn’t very pleasant as it didn’t taste very fresh either. My partners veggie breakfast also had soft poached eggs, and the combination of everything went together well. The guacamole didn’t taste very fresh, it was more like the pre made stuff that you buy in the supermarket which was a shame! Everything on the plate was cooked fine but it really didn’t blow my partners mind, and he didn’t feel like he would hurry back to order it again. We asked for the bill and paid up and left, we were impressed with our service but the food didn’t wow us and I don’t know if I will be rushing back. 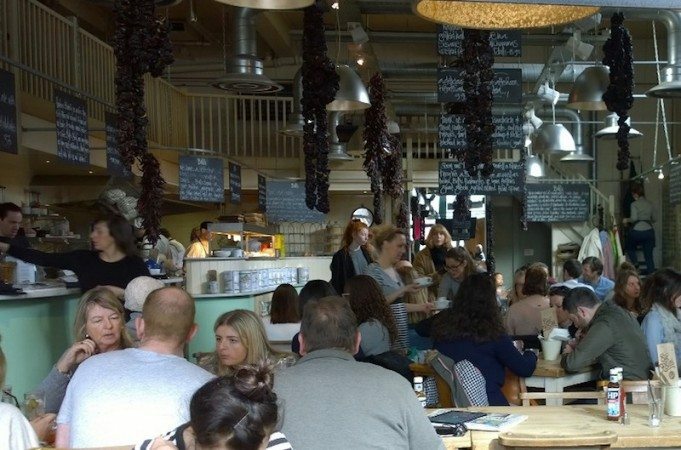 I think it’s a good venue if there are a big group of you, and you just want simple food and something to please everyone, but there are plenty of other smaller, independent cafes in Brighton serving delicious, fresh brunch, if you are looking to go somewhere nice in the weekend.